At The Experiment, we strongly believe that the best way for students to get the most out of their summer experience is to begin each program with a thoughtful and intensive orientation. On the day of departure, our trained group leaders meet students at the airport. The leaders immediately engage the group in conversations and ice-breaker activities. Right away, students get to know each another and their two leaders. The group will discuss important cross-cultural considerations and what it means to be a guest in another country. Upon arrival, students explore the host country and culture through fun, experiential activities. These activities involve engaging with individuals who live there and navigating select neighborhoods in small groups. With support and guidance from the leaders, students interact with their surroundings; they start experiencing the sights, sounds, and tastes of the country, and increase their confidence and cultural knowledge from day one. Explore the history of Chinese dynasties through a scavenger hunt in the Forbidden City. Search for regional delicacies in Paris and plan a picnic lunch in the Luxembourg Gardens. Visit Robben Island, where Nelson Mandela was imprisoned for 18 years, as you begin learning about South Africa’s history. Experience the sights, and sounds of Tokyo with Japanese high school students and your group leaders. Shop for exotic fruits and vegetables in San Jose’s mercado central. Build Communication Skills & Cultural Knowledge. The Experiment’s orientation activities equip students with new skills and knowledge — including practical language skills and cultural norms — designed to build students’ confidence in their ability to navigate new surroundings. These first few days help to set the tone and expectations for their Experiment and are designed so students can get the most out of their summer. Consider the cultural differences of the host country. Go over cultural norms, such as those around greetings, personal space, meals, and traditional gender roles. Gain basic language skills through language-focused activities. Review health, safety, and security considerations to help students do their part in keeping themselves healthy and safe throughout the summer. Give students the opportunity to vocalize their questions, expectations, concerns, and ideas. Discuss the difference between judgment and observation. Consider new ways to observe, process, and learn. 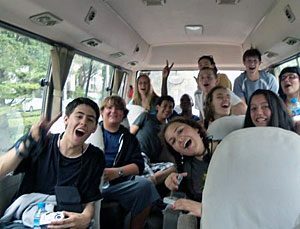 Practice culturally-aware interactions to prepare for the homestay. Build rapport and friendships among group members and with the group leaders. During orientation, group leaders might also encourage students to consider their own backgrounds and any presumptions, ideas, and values they may be bringing with them as they engage with their host communities and the other members of the group. In each country, The Experiment works closely with an international partner. Many of The Experiment’s partnerships are decades-old. These in-country partners contribute enormously to the educational and immersive nature of every program, and they play an essential role in maximizing the health, safety, and security of all groups. Group leaders work closely with the local office throughout the program. Local partners are actively involved in the program orientation. The Experiment begins working with students and parents on how to get the most out of their summer experience abroad well before the program departure and orientation. Students receive information about the host country and other important pre-departure materials in the weeks before the program commences. The Experiment staff strongly encourage all students to learn as much as possible about the country and culture prior to departure.